Ania Kruk is a type designer from Poznan, Poland. She currently lives and works in Barcelona and Google Web Fonts is proud to include her first published typeface, Cookie. Q: What is your background as a designer, and how did you become interested in type design? Actually, I'm still a beginner in the world of type design: I have drawn letters for only 2 years. I've recently graduated from the University of Arts in Poznan, Poland. Originally, I studied product design, but after 3 years I found myself more interested in graphics than in furniture. So I took a one year break and moved to Barcelona, Spain, where I worked as an intern in Estudio Mariscal (which was quite an experience, as they were working on the 'Chico y Rita' movie at that time), and did a one-year Masters in Typography and Editorial Design at Eina, Escola de Disseny i Art. When I came back to Poland for my last year of studies, I was 100% sure that I wanted to focus on type design. Q: What is your favourite part of the type design process, and why? Generally, I'm interested in complex, narrative projects that require creating a whole from various elements (meaning: editorial design, information design, typography). Type Design is not about designing one letter, it's about creating a system: the alphabet. I like the moment when you can start writing words and sentences with your letters, because then you can actually work on the flow and on the balance between the characters. For example, to make some of them more 'normal', transparent, in order to make others more distinctive or decorative. Q: Designing a new typeface is a long journey. What inspires you to keep motivated throughout all the different stages? For sure, Type Design is all about details, that an average user won't even notice, so you need to be patient to do this kind of work. I'd say I'm quite competitive, so when I see other peoples projects and I think 'Wow, that's so cool! ', it get's me motivated ;) I spend an awful amount of time digging through the internet, checking out blogs, personal websites, etc. Q: Can you recommend how other type designers can learn the skills involved in making type? It's hard to say, because I'm still learning myself. But I'd say that calligraphy and drawing are essential to understanding the construction of the letters. Q: What do you think could be improved about the type design process? 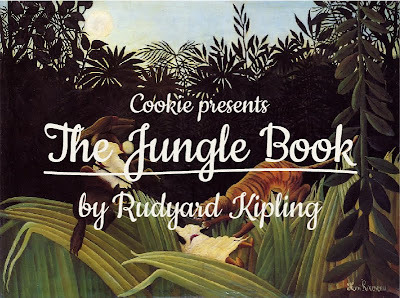 Q: What inspired you to create Cookie? 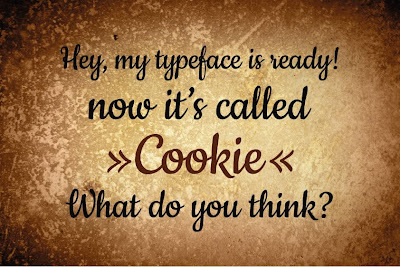 Cookie is a script typeface, based on brush calligraphy. It has a little bit of the 1950s look, that makes you think about all the beautiful ads and pin-ups from this time. It's sweet and friendly - but not too decorative. I tried to keep it simple and legible. Q: Did you try to accomplish something specific with this typeface design, and did you succeed? It's my first script typeface, so the whole design process was like discovering a new way of working. I wanted to create a typeface with a nice flow between the letters, and I wanted the letters to join in a natural way - that's the tough part, if you think about all the possible combinations between 26 lowercase characters. I hope it works ok...! Q: What kinds of uses are most appropriate for this font? Q: What are your favourite fonts, and why? Well, I don't really have any favourites. It all depends on the context and what you want to communicate: a typeface can be perfect for one kind of a job, but look horrible when misused. There are some surprises: I've always considered Mistral by Roger Excoffon as very kitsch and ugly, until I've seen it in on the opening credits for the movie 'Drive'. It looked just great, combined with the music and pictures. Where is the website for this font? Dear tkapler, if you download my font you'll be happy to discover that there are all polish caracters included. please check first, and then post comments. thanks. I could eat this cookie right up! It's friendly and fresh. Hope you make more fonts for google! It's frustrating. Cookie is very nice but I can't understand why Google don't get support for polish diacritical marks. Do you know Ania? Maybe this font should get marked as latin extended?!? I also can't see slovenian glyphs č, š and ž. Tried in Google Web Fonts by typing in my own text, which included those characters, but they are nt displayed. Otherwise I just love Cookie! I plan to do un update on Cookie shortly (after I'll be done with some other type design projects), mainly to correct all the diacritics and some methematical symbols: so please be patient, and I'll let you know when the full Latin Extended will be ready. I need to download this font on my computer....could you please tell me where and how I can get it? Dear Ania, I like the font very much, it will perfectly match my "Christmas & New Year Cards" application I would like to use it, however it is a commercial app. What is the story with the licence? Can I use it? Please let me know. All the information of this blog is really interesting regarding the designing segment of websites. A little history: I myself have been over expeditions to Mera peak, Island peak, Kalapathar, Gokyo peak, Tseryo RI and across many high passes in Nepal, Larkye Pass, Ampulapcha Pass, Chola pass, Renjula pass, Tashilapcha pass, Ganjala pass, Thorong La pass, Tilicho pass, (Mesokantola pass). Within the long span of an adventurous journey, I have extensive guiding experience on Mt. Kailash, Lhasa in Tibet also Ladak and Sikkim in India. Enrollment for 7 years long journey gives me courage to work out for an independent organized trekking agency. Appreciative for such brilliant blog yours...! I have just visited your website and found it very enjoyable. Your information is very useful for the readers who want information about website using SQL injection. Thanks for sharing and please keep sharing. Great Post! Loved your blog. Web application development services will successfully change the execution of your online business So, hire our skilled web application developer to get customized applications for your business. développement web de commerce électronique"
These blank templates range from monthly Free Printable calendars Templates without holidays or other information to completely blank grids with no dates listed. very nice model.I am really happy.Thanks for this shring. Woah! i'm appreciating the appearance vogue layout/topic of the location. It's direct, in any case powerful. oftentimes it's fairly exhausting to encourage that "impeccable parity" between nice alternatives and appearance and feel. I even ought to say you have got completed a real activity with this. Iqooster : Âge. de construire et d'obtenir leurs muscles aussi énormes que possible. Une interprétation erronée prend de la force, mais est apparue à des fins de contestation. Pendant de nombreuses années, nous avons regardé les hommes forts et aussi leur énorme chair. Le plus grand et plus fort le plus élevé! C'est certainement l'état d'esprit dans l'obtention d'un degré optimal d'athlétisme de nos jours dans cette culture. Testo Ultra : Malgré cela, si votre connaissance de cette histoire est grande, vous pouvez le faire. Je voudrais juste avoir plus de sensibilisation à la santé masculine. Dans cette histoire, je vais vous donner quelques conseils pour vous aider avec cela. Anda akan mendapatkan pengalaman bermain Poker Online, Domino Online, dan Bandar judi Online yang terbaik. terpercaya, banyak Pemain yang sudah bergabung dan dipastikan Anda akan bermain secara fair, player vs player tanpa campur tangan robot. Segera kunjungi dan langsung daftar, ada bonus 20% yang sudah menanti Anda untuk deposit pertama.